Agreed that quantifying laser rot on LD and explaining what damaged soundtracks sound like isn't an easy task. If some of you could send me a few pictures or sound recording (a short YouTube video would work too), we could setup as quick FAQ pages to make this subject more palpable. Thanks to Techmoan's video on CD Video, I at least know what a damaged digital soundtrack sounds like. Laserdisc "laser rot." What to look for. I need to go to bat on this: I got into LD in the mid-90s and rode it out all the way to the end of the tunnel, and it was absolutely maddening to deal with rot in those days. During the late '90s, the market was enriched with Sony-pressed LDs, so they were everywhere. These were huge releases, and they were sold in (relatively) huge volumes. It was an agonizing experience, repeated more times than I care to remember: spending $29 to $59 in 1999 U.S. dollars for a new release, only to discover later on that the product had spoiled, and that you had no financial recourse. If you were an LD collector in the late '90s who enjoyed mainstream movies, laser rot cast a gloomy shadow over the whole scene, and I know some people who stopped buying LDs altogether because of it. From the start of my experience with LD collecting until about 2005, considerably more than 1% of my LDs had laser rot. Some of them had rot right out of the package, and some didn't reveal themselves until years later. Back then, for newly purchased LDs, it felt like my rot rate was about 50%, but looking back, I suspect it was closer to 15%, 20% at the most. This also meant that the second-hand market was flooded with rotted LDs, for the obvious reason: what was an LD owner to do after discovering that some of your collection has rot? Why, sell it off to the local used-media shop, who would mark it up and turn it around sight-unseen to an unsuspecting customer. Collect a little bit of cath, and let it be someone else's problem. As such, during this time, my second-hand purchases were probably 30%+ rotted. Part of the problem was that it took a while for the trends to come to light, and that the average consumers weren't able to reliably determine rot risk in advance. This left a lot of us living in anxiety that our entire collections would eventually rot away. My local LD shop (Videophile in Seattle) would take returns if the rot was caught early enough. I'm not sure if they had to eat that cost, or if they were able to return it to the manufacturer for a refund. And once it became obvious, the clerks gave me the advice to avoid Sony pressings altogether (and they also taught me how to identify the LDs themselves by the barcode and other information on the hub), and this gave me faith in the hobby again. Thus informed, it was revelatory to go to a second-hand shop, browse the used LDs, and see that the majority of them were from Sony. My collecting has slowed down over time, and thankfully I haven't seen a rotted LD in a decade or more. I like to think that most of the rotters have been chucked into the bin over the ensuing years, but I'm also extremely careful about assessing an LD title for rot before purchasing it. LDDB's "rot status" information is extremely handy when considering a purchase, and I avoid anything that has a status above "low". And of course, I unconditionally avoid all late Sony pressings. It's just not worth it, especially if a good copy of that movie is available on DVD or BD. I wonder how many rotters have been chucked. When I sold on the bay, I chucked every rotter I got into the trash. If you're gonna let them become somebody else's problem, make that somebody else the garbage truck driver. But yeah, this is definitely why I'd rather stick with used. At least then someone has - recently, I hope - watched it and confirmed that it does indeed still play. And if not, I can at least ask them to check before purchase. When I sold on the bay, I chucked every rotter I got into the trash. I do that too when finding a rotter: trash the disc but eventually retain the cover and/or insert if it can help someone on day to replace a missing one. Recently bought some LD´s and there's this white-speckled patterns on the surface of the discs. If I rub on the most center with a dry cloth (closest to the label on the very shiny silvery surface where there's no data stored) it would come off to some extent, like some sort of dust. But on the disc itself it won't come off. I've tried with a damp cloth but to no avail. I cannot describe it better than it looks like if you would spray your hair with hairspray and having the disc lying in the open close by and falling residues from the hairspray land on the disc. Have you tried playing the discs?... might play fine? If it’s on the surface it is NOT rot. I've about 10,000 LDs and to my knowledge about 200 are rotters so about 2% rot rate. In those figures I'm not counting early pressings which pretty much all had a few speckles here and there. I'm just focusing on real rot that rendered the disc not worthy of watching due to distraction. Sony was the worst by far and I agree if you'd been buying Sony USA pressings I suspect the rot rate would have been as high if not higher than you quote. My first ever bulk purchase of laserdiscs was a bundle of discs included with a Sony player. The player was wonky from the start and skipped but what annoyed me most was most of the discs were actually rotted. The seller had clearly offloaded the whole lot in an attempt to claw back as much money as they could. I agree 10 years on there is less of this going on, but certainly anyone buying sealed Sony titles is playing with fire. In addition to what others have said I would just add some early Sonopress UK titles (which were produced several years before PDO existed) were problematic as well. Some 80's Japanese Toshiba EMI discs and Pack In Video titles had rot as did many early USA Technidisc titles like Tuff Turf although again perfect copies of even that movie do exist on LD and are actually worth tracking down as the picture quality is superior to the DVD. Haven't had the chance to test the discs yet. It seems to be some kind of chemical reaction with the plastic coating of the disc. It must have come in contact with some sort of material that caused the plastic coating of the disc to react like this. 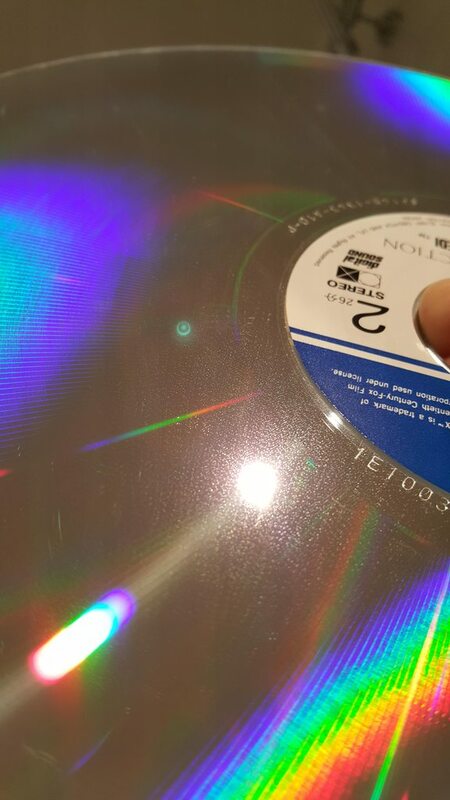 Laserdiscs are tricky to photograph as they are so reflective but if its only on the surface Novus 1 Polish should be able to clean that mist off and it will be as good as new. I've found a layer of mist forms on LDs if they have been left in polylined bags for many years without being taken out. You often seen this on sealed stock that is decades old. Most likely some form of gas given off by the plastic which results in a buildup of particles on the surface of the disc. Also happened with some EMI Swindon CDs from the 90's and they could be polished as well and were fine. Novus polish 1 has now been ordered. Yes I remember I have seen exactly the same phenomenon on other discs in my collection. I have always thought it was disc-rot. But this explains the white mist on the surface. I have now test-played the disc in question and it plays normally. That just confirms what laserdisc_fan enlightened me of. A great relief to say the least. I only have around 130+ discs and only have two titles that have any rot. One plays mostly fine and the other is basically unwatchable. So from my limited knowledge, that 1-2% sounds accurate. If it’s the same kind of bag-to-disc speckles I’ve had it’s easily cleaned off but doesn’t affect video at all so leave it for the next guy if you want. It only happens when the disc sits untouched for years, I think, because I’ve never seen it on anything I’ve owned. Other people’s unwatched stuff that I buy has it quite often. I use Windex and a paper towel. Go ahead and tell me how bad it is, I don’t care, I’ve been into optical discs for almost 30 years and Windex has never killed anything of mine. The same episode also did a pretty good job of showing you what rotted video looks like. Technology Connections's video shows it pretty well too. The disc sounds fine but the video is peppered with rot noise. Over the years I've received a few LDs where whoever was cleaning them was a little too enthusiastic with the liquid cleaner. They must have poured loads onto the surface of the disc and it actually seeped between the two sides of the disc leaving some odd marks along the edge. If you moisten a tissue with a small amount and use it to apply the cleaner only on the surface you can't go wrong.